Home > Nail Polish - OPI, China Glaze, Essie & more > ChGl EverGlaze Extended Wear Nail Lacquer > ChGl EverGlaze Extended Wear Nail Lacquer, Orange You Obsessed? ChGl EverGlaze Extended Wear Nail Lacquer, Orange You Obsessed? 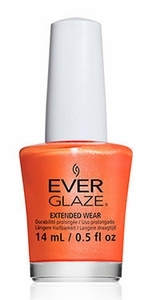 ChGl EverGlaze Extended Wear Nail Lacquer, Orange You Obsessed?, 82311, .50 fl. oz. Bright neon orange nail color with shimmer. *Please note: China Glaze EverGlaze Extended Wear Active Top Coat should be used with this nail polish for maximum results.